« Super Monkey Dash: Go Bananas! – Now Available on the App Store! I’m proud to announce the my first app for the Google Play store – Super Sports Match Game! Over the years I’ve done a fair amount of Android development for corporations and private clients, but nothing until today that I’d self published. Super Sports Match Game is a great spin on the traditional matching puzzle games. 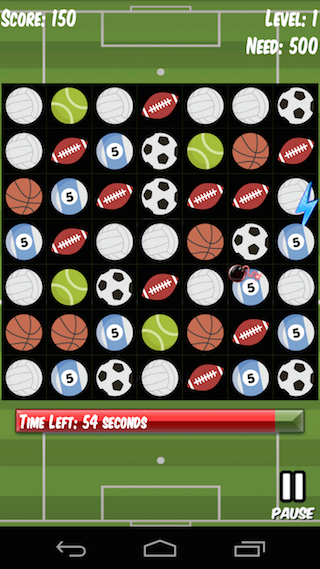 Play with balls from 6 different sports to make matches and create huge combos! Match 3 or more different balls to make matches. The more balls you match and the more combos you hit, the higher you score!. Make timely use of bombs and lightning balls to really blow up the board and shake things up. You’ll have to be quick and crafty to complete the levels before time expires. It starts out easy, but can be challenging in higher levels! I hope you enjoy it. Of course, like all my games, its free. Download today!